Verizon’s launch of a commercial HIT platform sparks excitement but also raises questions about meaningful use and cost factors. In this new era of HIT adoption, the HITECH Act states that providers must prove meaningful use by participating in some sort of health information exchange (HIE) in order to qualify for the allotted dollars. However, the effective—and secure—exchange of health information continues to be one of the bigger challenges facing healthcare organizations. There are currently three types of health information exchanges. State/government-supported efforts are typically built off a combination of Medicaid/Medicare databases and any state university hospital system record databases to establish critical mass. Backed by the American Recovery and Reinvestment Act (ARRA), State Health Information Exchange Cooperatives received more than $500 million in funding. The second type of HIE are those that are vendor sponsored, such as the ones from Axolotl (the largest) or Epic. In many cases, these HIEs connect with only provider organizations that use the sponsoring vendor’s software. Finally, there are commercial HIT platforms that attempt to establish themselves as a national warehouse for all other exchanges to feed into. This would include the exchange recently launched by Verizon, which has received a lot of buzz since the company formally announced the project at the annual HIMSS conference in March. For many, using an exchange is another step toward achieving meaningful use, but Dale Kivi, MBA, head of business development for FutureNet Technologies, warns there’s more to it than that. “Routing a document through an exchange vs. sending it as a fax does not constitute meaningful use,” he says. “If the primary benefit from an exchange is point-to-point electronic delivery of documents from a provider organization to a remote physician, they’ve completely missed the point. For the information contained in the reports to truly deliver what the government is looking for in meaningful use, it must go beyond what is needed for the direct care of an individual patient by the physicians who administered care (and generated the report) and those that they directly copied (as facilitated in today’s preexchange EHR environment). ARRA funding is not a gift for simply doing what has been considered common industry practice for over a decade. 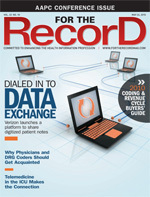 The Verizon platform, known as the Verizon Medical Data Exchange, has generated a lot of curiosity within the industry. It provides a way for medical transcriptionists to share digitized patient notes detailing care and treatment with doctors, hospitals, and other healthcare providers. The company developed the platform for the Medical Transcription Service Consortium, whose founding consortium members MD-IT and MedQuist are currently using the platform. According to Verizon, by August, when the exchange is expected to be in use by all of the consortium’s members, 350,000-plus physicians, more than 2,700 clinics, and nearly 2,500 hospitals will be supported. Temple adds that for many, Verizon’s Medical Data Exchange may be a stepping-stone toward demonstrating meaningful use, and that’s important for getting those economic incentives. “There are many things that need to happen in order to demonstrate meaningful use, but this can help providers with stage one: the ability to pass electronic results back and forth,” he says. “Verizon and their partners have brought considerable expertise and resources to this project and are demonstrating that HIEs are not necessarily public or private by nature. Like most significant advancements, we believe that the building of a national, interoperable platform will likely come from a balance of the two,” says Ivie. Still, with all of the funding that went into creating the establishment of the State Health Information Exchange Cooperative Agreement Program to advance appropriate and secure health information exchange, many can’t help but wonder why those government-funded projects have not been more successful and whether they will be down the road. But the bottom line is, whether the options are public or private, data exchanges are part of healthcare’s future and just another step forward as the industry continues its advance toward going digital in a new, more meaningful way.